Unboxing: Inspire Me Korea Cleanse Me Beauty Box | Memorable Days : Beauty Blog - Korean Beauty, European, American Product Reviews. 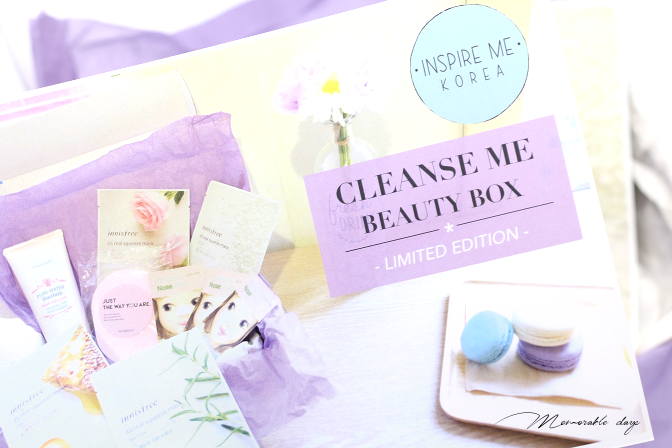 In today's blogpost I am unboxing the Inspire Me Korea Cleanse Me Beauty Box. 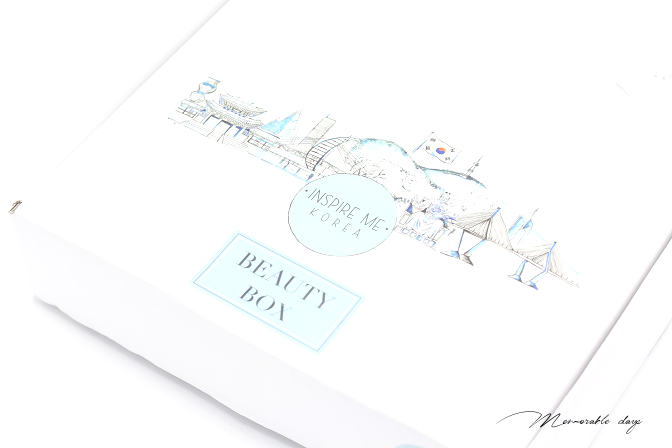 It is a limited edition beauty box from Inspire Me Korea. It includes best-selling Korean beauty products that you can add into your skincare routine. It includes products from Innisfree, Etude House and Half Moon Eyes. Spoil yourself with this box or give it to a special person who likes Korean Beauty! It is a lovely gift for the holidays! Read it all in today's blogpost! Inspire Me Korea is based in the UK. They spread awareness of Korean culture across the globe. They launched their first Korean subscription box in February 2016. Each box includes a variety of elements to Korean culture: Food, Beauty, K-pop and Culture. You can have for example a monthly surprise box for £13.99 per month. You are able to chose between a girls, guys or unisex box. 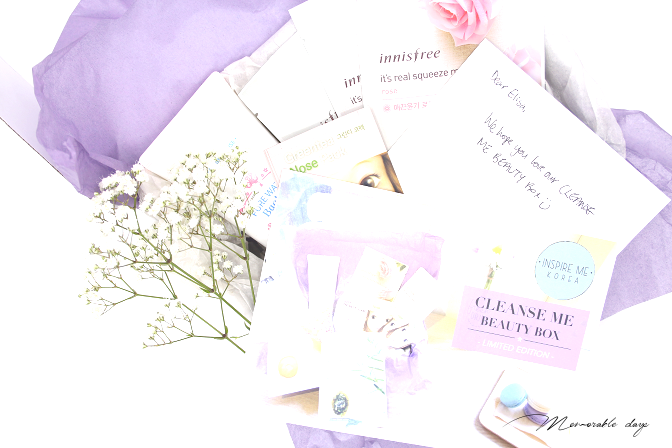 They currently have a taster box as well for £7.99 and the cleanse me beauty box that I am unboxing in today's post. Once you open the box, you are able to see a sheet where you see descriptions of all products. The oxidizing properties of green tea will clear out impurities and blackheads from your nose, leaving it clean and smooth. There are 3 included in the box. 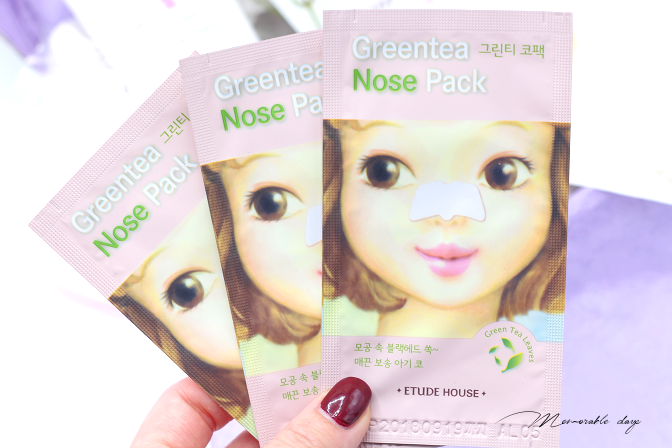 It's always fun to use nose strips because it works instantly and you are able to see the yucky stuff (black/whiteheads) coming out and sticking on the nose strip haha, I am curious how effective these are. I have never heard of this brand before but this is the cleansing sponge from Half Moon Eyes. You can use it with the Etude House cleanser that is also included in the box. It makes it foam more! 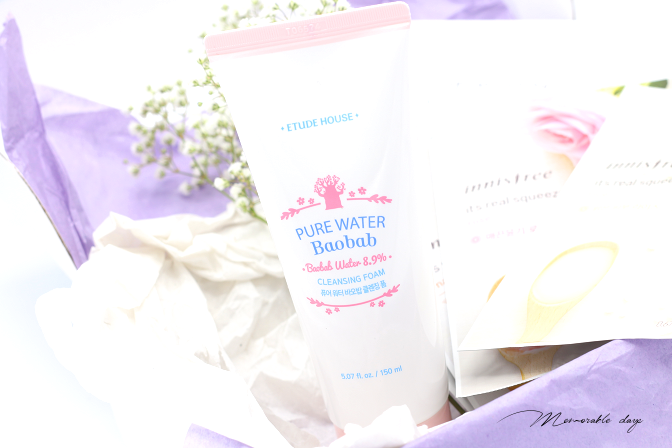 This cleanser is from their pure water baobab skincare line. It is a mild and gentle cleanser that lathers a lot, containing 22% plant originated moisture ingredients and 8.9% baobab water. I haven't tried it yet, but when a cleansing foam lathers a lot the pH might be high, so I am curious how this feels on the skin and what the pH level is. It removes impurities deeply leaving your skin moist. It comes in a squeeze tube that includes 150ml of product. 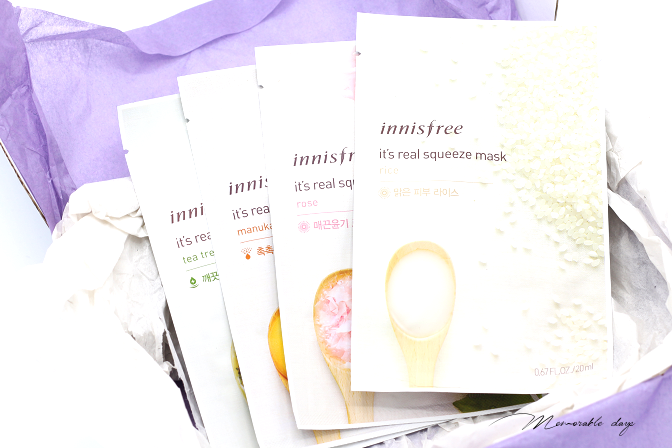 I have always been a big fan of Innisfree masks, because they are moist and inexpensive. The box includes 4 sheet masks from Innisfree: the rice mask, manuka mask, tea tree mask and rose mask. 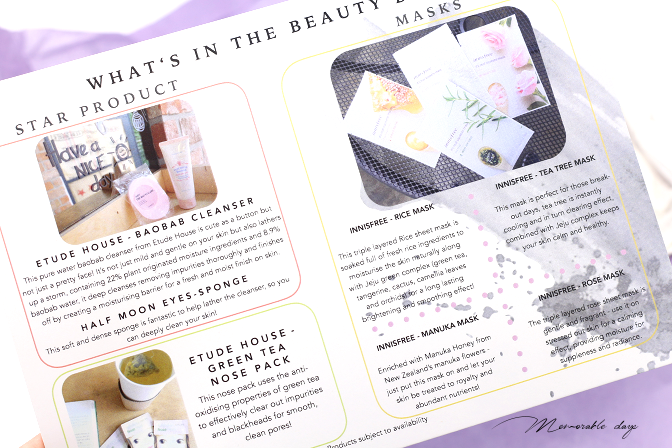 You are able to purchase this beauty box at Inspiremekorea.com for £24.99. They ship worldwide and the shipping price varies per country of destination, check out the rates here. If you are new to Korean beauty, this is a nice box to get to know Korean brands and products. It might be cheaper to purchase the products separately, but the box is packed very nicely and it looks like a lovely gift that every K-beauty lover would like. I love it that you can even gift a monthly subscription box to your friend. note: this box was sent to me for review purposes, this didn't affect my opinion about the box. I didn't receive money to write about it, see disclaimer.